West Point Lighthouse block designed and pieced by Anita of Daydreams of Quilts. Quilted by Dara of Stitched Quilting Co. I didn’t really think of this when I made the quilt along schedule but yesterday was our 18th wedding anniversary. We went to Prince Edward Island for our honeymoon and one of the places we visited was the West Point Lighthouse. So it’s a fun coincidence that I am releasing this block the day after our anniversary. PEI is one of my most favourite places on earth! I have been there three times and really hope to get back again soon. Glad I could help represent the East Coast in this quilt along! Even though I’m an Albertan, I do love PEI and I lived in New Brunswick for four years too. Click here to download the Lighthouse Block pattern – CSQAL West Point Lighthouse Block Pattern I can’t wait to see the lighthouses pop up this week. 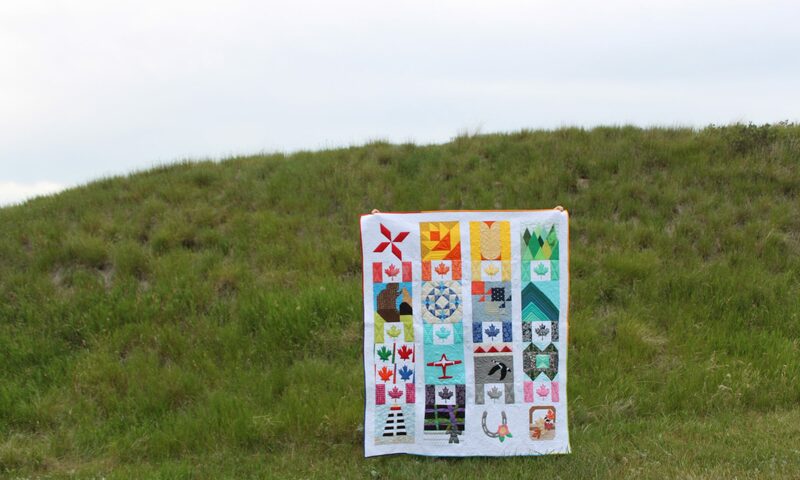 Post your lighthouse in the hashtag #canadiansummerqal on Instagram for a chance to win a selection of four fat quarters of Flourish from the Daydreams of Quilts shop. I tried to download the pattern via your link to your shop and it keeps trying to charge me shipping. Is there another way to get the pattern? Thanks! Hi Pamela. Select “free local pickup” for shipping. I accidentally had it set as a physical product but I have fixed it. Thank you for letting me know.